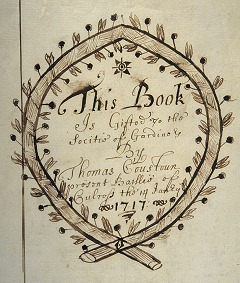 Gardeners' societies appeared in Scotland during the seventeenth century. Working gardeners started societies to promote and regulate their profession and to support themselves in time of need. As time passed the main aim became the members' benefits - they were friendly societies. Non-gardeners could join most lodges. They were called 'free gardeners' and soon they out-numbered working gardeners. All through the 19th century free gardeners continued to found lodges despite the attractions of the many other friendly societies, such as the Foresters, Buffaloes or Oddfellows. Free gardeners made up their own rituals and practices, which helped unite the brethren of each lodge. 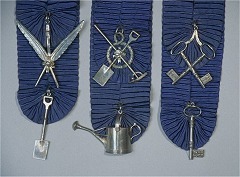 Some of the societies joined together in 'Orders' led by a 'Grand Lodge'. There were several orders based in Edinburgh, Glasgow and England. Some of the older lodges stayed independent. At their height in the Lothians there were over 10,000 free gardeners organised in upwards of 50 lodges. Juvenile and even women-only branches opened at the end of the 19th century. The free gardeners are now part of history. Some of the societies are known only by name. Many different collections hold a few surviving documents or pieces of regalia. Luckily, the archives of the Dunfermline and Haddington bodies have been preserved. 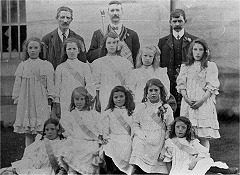 The resources on this website have been collected from many different institutions and collections across the Lothians and Fife. We hope that the seed planted here will grow and inspire others to unearth the history of the movement.